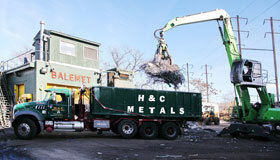 Scrap Metal Recycling Companies such as H&C Metals, Inc. and its sister company, Balemet Recycling, function as “surface mines”– the first step in the recycling process for the life cycle of scrap industrial and consumer products, in particular, metal & electronic scrap (E-Scrap). Scrap Metal: Obsolete, excess, used or damaged products & material such as beverage cans, industrial waste, Steel, Copper, Brass, Aluminum, Appliances, Auto scrap and Car Batteries are purchased, sorted, prepared & packaged for shipment. Domestic and international consumers of scrap metal, such as smelters, mills & foundries complete the recycling process by melting these materials and manufacturing new products for the global market. E-Scrap: domestic, environmentally responsible computer recyclers, dismantle post-consumer electronics and the elements contained are reclaimed for manufacturing a variety of new products, including electronics. See the environmental benefits. For a commercial property or residence, scrap pickup and removal can be a challenge without having a truck or the proper equipment to haul it away safely. H&C Metals can pick up and remove a variety of metals. To accommodate your service requirements for removing scrap, we can address your transportation and loading challenges by providing a wide range of trucking and equipment options. H&C Metals, Inc. is an NJ DEP (Department of Environmental Protection: Solid and Hazardous Waste Management Program) approved hauler of universal waste: computer and electronic scrap (“E-Scrap”). H&C offers businesses of all sizes and the general public, a home for select un-wanted electronic and computer waste. Call H&C Metals for expert, professional services and advice regarding the rigging, removal and hauling of interior scrap metal from a commercial or residential clean-out project, a remodel or interior demolition. Construction materials such as BX Cable, insulated wire, metal studs, duct work, plumbing, etc. H&C Metals, Inc. owns and operates CFC and refrigerant recovery equipment as well as Freon storage containers for the purpose of contributing to environmental sustainability. This equipment enables H&C Metals, Inc. to safely reclaim and eventually repurpose Freon from A/C units and refrigerators sold as scrap. In keeping with the U.S. EPA Clean Air Act of 1990, H&C Metals, Inc. complies with the refrigerant recycling requirements as described in: 40 CFR Part 82, Sub Part F, and Section 608 Refrigerant Recycling Rule of the Clean Air Act, which prohibits individuals from intentionally venting ozone-depleting substances used as refrigerants (CFCs/HCFCs) into the atmosphere while maintaining, servicing, repairing, or disposing of air-conditioning or refrigeration equipment (appliances). 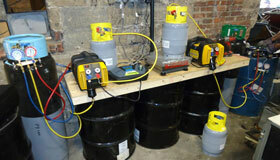 See video on how Lead Acid Batteries are recycled. Professional on-Site Consultation: When you have scrap metal and E-Scrap to dispose of but are unsure of what you have, it’s potential value, if it can be recycled and how to package & transport it– please contact H&C Metals, Inc. & inquire about receiving a free recycling evaluation and consultation. Metal Analysis: H&C Metals, Inc. utilizes high-tech, specialized equipment for analyzing metal in the field, or at our facilities, providing material identification and for determining value. Our customers benefit by ensuring they receive maximum compensation for their scrap. Get paid for your scrap metal and electronic/computer waste at our Newark location.